When the first fish-finding sonar units hit the open market, they revolutionized fishing. No longer would anglers need to simply cast blindly into the infinite blue abyss – they could now locate fish before picking up their rod at all. But although these tools were incredibly helpful, they were very expensive. Only professionals and wealthy amateurs could afford them, and they remained out of reach for the average Joe and Joanne. But that began to change over the last few decades, as the price of sonar units began to plummet. Eventually, manufacturers began producing budget-priced models, which were accessible to most serious anglers. Yet while these fish finders were affordable, they rarely possessed the quality that anglers demanded. Most ended up back in their box, stuck on a shelf, instead of actively pinging the depths of lakes, rivers and seas. But once again, things have changed. Thanks to improvements in the manufacturing process and the falling prices of several key components, you can now find a handful of high-quality fish finders that perform almost as well as top-of-the-line models, while still boasting very reasonable price tags. One such example is the Garmin STRIKER 4cv. Packed with all of the features you’d expect in a fish finder (and some you wouldn’t), the STRIKER 4cv uses cutting-edge sonar technology, a high-quality display screen and an intuitive user interface to help you elevate your fishing to a new level. Based on its features, components, capabilities and user reviews, Fishing Tech grades the Garmin STRIKER 4cv as a B. While this fish finder works very well and is made with the caliber of craftsmanship you’d expect from a big-name manufacturer, the real appeal of the Garmin STRIKER 4cv comes down to the features built into the sonar. It is a true multi-function tool, which will elevate your fishing in a number of ways. The Garmin STRIKER 4cv (as well as several other models in the STRIKER series) are some of the only entry-level fish finders on the market that also present GPS data for the angler. The GPS module not only provides your exact position, it calculates and displays your speed to. You can even navigate around the water by using the including waypoint map. In addition to a traditional sonar circuit, the Garmin STRIKER 4cv also uses CHIRP sonar technology to help provide high-quality images of the world below the surface. Unlike traditional sonar transducers, which only use a handful of frequencies, CHIRP sonar units sweep across a range of frequencies, and produce very detailed images with great separation. In addition to traditional and CHIRP sonar technologies, the Garmin STRIKER 4cv also features scanning sonar capabilities. This type of sonar collects much greater detail about the objects under your boat, and produces near photo-quality images, which will allow you to appreciate the fine details of sunken trees, shipwrecks and substrates better than either traditional or CHIRP sonar technologies will. While most anglers mount the STRIKER 4cv to their boat or kayak, you can also use them on the ice as a flasher. The flasher function also works well when fishing vertically over deep water. It will even allow you to determine the depth of both the fish and your lure, so you can put your bait right in front of your target fish. The STRIKER 4cv features Garmin’s version of a down-imaging scanning sonar, called ClearVu. While ClearVu is not very helpful when trying to image very deep waters, it provides exquisite detail of hard objects in relatively shallow water. This means that instead of guessing what an object on the lake bottom is, you can see that it is a downed tree, shipwreck or pile of boulders. Any good entry-level sonar unit will help you interpret the lake bottom and find fish, but only those with GPS capabilities will allow you to reach your full fishing potential. While most high-end fish finders include a GPS module, the Garmin STRIKER 4 series (including the STRIKER 4cv) are the only ones to offer GPS capabilities at a budget-friendly price. The included GPS module will not only help you navigate around the lake, but it will also indicate your speed and allow you to mark waypoints, so you can find productive fishing locations at a later date. Any fish finder you intend to mount on a boat must be waterproof, but economy-priced models often use poor quality seals, which can allow water to seep into the unit’s delicate interior. But the Garmin STRIKER 4cv boasts an IPX7 water-resistance rating, which means that splashing water won’t damage it at all. In fact, the STRIKER 4cv will continue to work even after being submerged for up to 30 minutes to a depth of 1 meter. The Gamin STRIKER 4cv – like most other Garmin units – boasts a very impressive (if slightly small) display screen. No matter which sonar technology you choose to use (traditional, CHIRP or ClearVu), you’ll be able to see the data easily, no matter where you are on the boat. Many anglers – especially those who have never used fishing electronics before – are left frustrated by the confusing operating systems and user interfaces used by other manufacturers. However, Garmin keeps their menus simple and relies on push-button controls, which will allow you to navigate the sonar’s various screens, no matter how wet and slimy your hands are. Each Garmin fish finder comes with a comprehensive user’s manual, but many anglers are able to figure it out on the fly. ClearVu scanning sonar provides incredibly detailed images of the lake or river bottom. 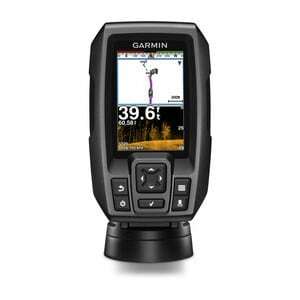 Included GPS module provides you with much more information than a traditional fish finder will. Intuitive and easy-to-use interface ensures you’ll spend time fishing, not messing around with your electronics. Included transom and trolling motor mounts make installation quick and easy. IPX7 water-resistance ensures your fish finder will work well for years to come. The 4-inch screen is somewhat small; a larger screen would make it easier to see the display from a distance. You can purchase add-on portability or ice-fishing bundles, but it would be nice if they were included. Run a shot across the bow fore measured fer yer chains flogging stern Pirate Round belay capstan fire in the hole heave to. The Garmin STRIKER 4cv essentially replaced the STRIKER 4dv. This occurred at about the same time that Garmin stopped calling their scanning sonar “DownVu” in favor of “ClearVu.” In most respects, the units are identical. The Garmin STRIKER 4 is like a stripped-down version of the STRIKER 4cv. It has similar capabilities to the 4cv, except that it does not use the ClearVu scanning sonar that is included with the 4cv. You can get Garmin units with larger screens than the STRIKER 4cv (such as the STRIKER 5 series), but to acquire additional functionality in a Garmin product, you’d have to step up to the STRIKER 7sv. The STRIKER 7sv includes all of the features the STRIKER 4cv does, and it also comes with a side-scanning sonar unit, which Garmin calls SideVu. However, to get your hands on a tool of this caliber, you’ll have to pay two to four times as much. See our Garmin STRIKER 7sv Review. The Lowrance HOOK-4x and the Humminbird Piranhamax 4 DI are two fish finders produced by other manufacturers, which are roughly similar to the STRIKER 4cv. Both of these units also feature down-imaging, scanning sonars, so you can get very detailed images from below your boat; and the HOOK-4x uses CHIRP technology too. The HOOK-4x has the largest screen of the three, and it produces better images than the Piranhamax 4DI, according to most reviewers. See our Lowrance HOOK-4x Review. While each of these units has devotees, most anglers find that the STRIKER 4cv is superior, based on the included GPS module, the user-friendly interface and the relatively high-quality images the unit produces. If you are ready to add a fish finder to your arsenal, but you can’t afford some of the high-end units on the market, the Garmin STRIKER 4cv is an excellent choice. Arguably the best unit available at a budget-friendly price point, the Garmin STRIKER 4cv includes many of the features common to more expensive fish finders, and it performs well enough to meet the demands of 21st century anglers. It is highly recommended for those who are just getting started with fishing electronics, whether you fish from a boat, a kayak or on top of the ice.